Nutrients are not only essential for growth and development, but also provide young children with fuel to perform physical and metabolic functions. Nutrition also influences the efficiency of educational programmes.9 Adequate nutrition is therefore vital during the school-age years because nutrition and health influence a child's cognitive development.3,10 Children lacking certain nutrients in their diet and who suffer from protein-energy malnutrition, persistent hunger, parasitic infections or other food-related diseases, are likely to have a reduced potential for learning compared with healthy, well-nourished children.8 Difficulty in concentrating and performing complex tasks in hungry learners can be attributed to poor or inadequate nutrition.10 Nutrient deficiencies account for the inability of a child to achieve their full mental and physical potential because of stunted growth, low physical work capacity, reduced IQ and a lower resistance to infection.4 In a report compiled by Usfar et al.1, a study conducted in rural villages of Guatemala indicated a more rapid growth in children who received supplementation (with a vegetable protein mixture) while children who did not take supplements were stunted and at risk of chronic infections even during adulthood. Schools are uniquely positioned to promote healthy eating behaviours and attitudes among children, which may be the foundation for future dietary preferences and eating behaviour in their adult lives.11,12 Furthermore, school feeding schemes such as the National School Nutrition Programme (NSNP), a South African school feeding scheme, provide access to various nutritious foodstuffs that promote learners' health and their capacity to perform academic tasks.13 The NSNP was initiated in 1994 and, as an integral component of the Department of Basic Education (DBE), serves meals to schools located in communities with low socio-economic status nationwide in South Africa.14,15 The programme is funded through a provisional grant that is transferred to provinces according to the Division of Revenue Act and directives from the DBE and National Treasury (Grant Framework 2010/11).16 The provincial/district office and/or schools are allocated funds for the procurement of foodstuffs.17 Food items are then delivered to schools by private contractors and further prepared on the school premises.18 The NSNP aims to improve class attendance and participation among learners by alleviating short-term hunger.14 The UK government established food-based standards (to increase intake of healthier foods such as fruit, vegetables and oily fish) and nutrient-based standards (to promote an increased provision of foodstuffs containing essential nutrients) as guidelines for school lunches. 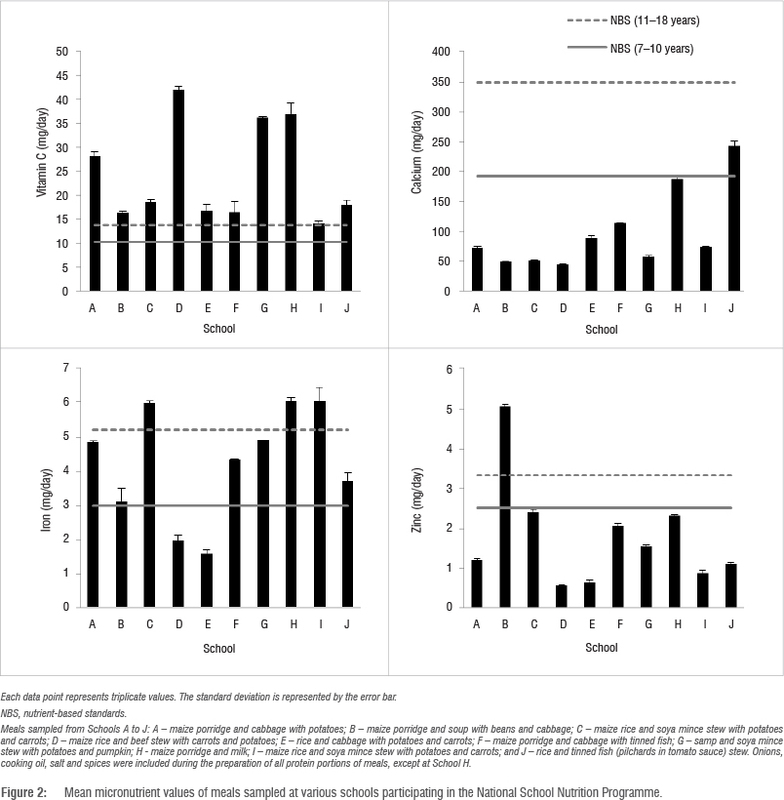 The standards are aimed to address concerns regarding the poor quality of school meals and to improve the quality and nutritional balance of meals served to schoolchildren.19-21 In this study, we used chemical analyses to determine the nutrient contents of the meals served during the administration of the NSNP in Bloemfontein, South Africa. The study aimed to cast light on the possible nutritional benefits or deficiencies of the school meals. Representative food samples were collected from 10 randomly selected schools that were beneficiaries of the NSNP in Bloemfontein, South Africa. The school sample included primary, intermediate, combined and special schools, categorised under the three quintiles - Q1, Q2 and Q3. This sample also represented an even distribution of schools in the urban and rural areas of the region. The NSNP representative or school principal was notified prior to the visit and arrangements were made to collect food samples which were collected during serving times (between 10:30 and 12:00) during the summer season. This notification was necessary because schools were found to not always adhere to the serving time stipulated by the DBE as they operate differently in terms of the duration of classes and general attendance. The samples consisted of representative portions of food that were served to children under normal serving practices. In an attempt to collect a variety of food and obtain a wider perspective on the nutritional benefits of the meals, the samples were collected on specific days with guidance regarding menus provided by the schools. Schools used the menu provided by the DBE,13 which gave detailed descriptions of meals to be served each day, as a guideline. Meal samples of between 267 g and 477 g were collected using latex gloves and placed in sterile polythene bags. Schools were alphabetically coded to maintain confidentiality. Samples consisted of the following from each of the schools: A - maize porridge and cabbage with potatoes; B - maize porridge and soup with beans and cabbage; C -maize rice and soya mince stew with potatoes and carrots; D - maize rice and beef stew with carrots and potatoes; E - rice and cabbage with potatoes and carrots; F - maize porridge and cabbage with tinned fish; G - samp (a South African staple food made from broken, dried corn kernels) and soya mince stew with potatoes and pumpkin; H - maize porridge and milk; I - maize rice and soya mince stew with potatoes and carrots; and J - rice and tinned fish (pilchards in tomato sauce) stew. Onions, cooking oil, salt and spices were included during the preparation of all meals except for the meal served by school H. The food handlers followed recommendations of the DBE in preparing the meals with some modifications according to availability of ingredients.15 All meals had been prepared on the day they were sampled. The samples were transported to the laboratory on ice and homogenised upon arrival at the laboratory. Sampling and analyses were performed in triplicate. calibration standards at concentrations of 0.4 g/L, 0.8 g/L, 1.8 g/L and 3.2 g/L were prepared for each reference sugar. The standard material was weighed, the appropriate volume of nanopure water was added and the mixture was vortexed for 30 s. The resultant solutions were filtered using syringe filters and analysed using HPLC. The sugars were extracted from the various food samples using a modified method as proposed by Barreira et al.23. Approximately 10 g of the homogenised samples was extracted using 40 mL of 80% aqueous ethanol (Merck) at 70 °C for 30 min. After cooling to room temperature, the samples were centrifuged at 3000 rpm for 15 min. The ethanol in the supernatant was evaporated and the extract was diluted to a final volume of 10 mL in nanopure water, filtered at 0.45 μm and injected for HPLC analysis. Total carbohydrate content of food samples was determined by difference,24 that is: 100 g minus the sum of grams of water, protein, fat and ash. With minor adaptation, the method proposed by Gressler25 was applied for the identification and quantification of lipids and fatty acids. To each homogenised food sample (5 g), 250 mg of pyrogalic acid (Sigma-Aldrich) (to minimise fatty acid degradation) and 5 mL of ethanol were added. For acid hydrolysis, 25 mL of 32% HCl (Merck) was added and the solution was shaken for 40 min at 70-80 °C, followed by vortexing for approximately 10 min. The lipids were extracted (at room temperature) with ethyl ether (60 mL mixed in vortex for 1 min) and petroleum ether (60 mL mixed in vortex for 1 min) (both were purchased from Merck). The samples were centrifuged (4000 rpm x 5 min) and the ether phase was evaporated to dryness under nitrogen gas. The residue was gravimetrically determined as total lipid content. The fatty acids in the extracted lipid were methylated to fatty acid methyl esters (FAMEs) with boron trifluoride/methanol complex (5 mL of 20% BF3/MeOH reagent) (Merck) followed by heating in 2.5 mL toluene (Merck) at 100 °C for 45 min under gentle mix. At room temperature, nanopure water (12.5 mL) was added and the FAMEs were extracted with 5 mL hexane (Merck). The hexane fraction was dried in nitrogen gas, suspended in 500 μL hexane and the solution was filtered prior to analysis. The fatty acids were analysed using a Finnigan Focus gas chromatograph (Thermo Fisher Scientific, Waltham, MA, USA) with a flame ionisation detector and a 25 mm x 0.32 mm ID SGE capillary column BPX70 and 0.25-μm film (SGE, Melbourne, Victoria, Australia). The temperature conditions were 100 °C for 5 min, 100-240 °C (at a rate of 3 °C/min) and at 240 °C for 20 min. The samples were injected at 225 °C and detected at 285 °C with helium (linear flow of 200 mm/s) as the carrier gas and a split ratio of 1:50. A 37-Component FAME mixture (Sigma-Aldrich) was used to identify the fatty acids. The Dumas combustion method as described by Jung et al.26 was used to determine the nitrogen content of food samples. The protein content was determined by means of a nitrogen conversion factor of 6.25. High-performance liquid chromatography-ultraviolet conditions The HPLC system used for the analysis of vitamins was the same as that described earlier for carbohydrate analysis, with minor variations. For vitamin separation, a Phenomenex Luna C18 (2) 5-μm 150x4.60 mm reverse-phase column (Phenomenex) was used and the analyses were performed under isocratic mode (mobile phase of acetonitrile) at a flow rate of 2 mL/min with the oven temperature at 40 °C. The injection volume was 10 and a UV detector was set at 325 nm for vitamin A (retinyl acetate purchased from Sigma-Aldrich) and 290 nm for vitamin E (δ-tocopherol, α-tocopherol and α-tocopherol acetate purchased from Sigma-Aldrich) to monitor column effluents. The retention times, peak areas/heights and the spectra of the standard compounds were used for vitamin identification. For standard solutions, a stock solution of each vitamin was prepared by dissolving 3 mg of the vitamin standard in 100 mL ethanol containing 3 mg of antioxidant butylated hydroxytoluene (BHT) (Sigma-Aldrich) as a protection reagent. With minor adaptations, the method proposed by Salo-Väänänen27 was applied to identify vitamin A and E contents of the homogenised samples. For saponification, samples of approximately 2 g were weighed into flasks after which 20 mL pyrogallol (15 g/L, dissolved in absolute ethanol, Sigma-Aldrich) and 10 mL KOH saponification solution (which consisted of 100 g of KOH pellets - purchased from NT Laboratory Suppliers Excom, Johannesburg, SA - dissolved in 100 mL of nanopure water) were added. Taka diastase (0.01 g) (Sigma-Aldrich) was added to digest starch and prevent formation of lumps. The flasks were heated at 60 °C for 30 min and cooled to room temperature for about 15 min. To avoid emulsion formation, 10 mL of 10% NaCl (Merck) was added. After saponification, the vitamins were extracted using three portions of 20 mL n-hexane-petroleum ether (80:20) (n-hexane was obtained from Merck). With each portion, the flask was vortexed for about 30 s and centrifuged (4200 rpm χ 5 min). The phases were allowed to separate, and the organic layers were washed with 20 mL of 5% NaCl and evaporated. Then 5 mL ethanol and 5 mL n-hexane were added to the flask and the solution was evaporated to dryness with nitrogen gas. The residue was dissolved in 1 mL n-hexane (containing 5 mg of BHT) and filtered (Whatman, 0.45 μm) prior to HPLc analyses. Exposure to high temperature and bright light were eliminated throughout the process to prevent the loss of vitamins. The total mineral content was determined by a dry ashing method during which the dried food samples were ashed at 525 °C overnight in a muffle furnace.29 The resultant ash was determined gravimetrically while individual minerals (calcium, iron and zinc) were identified and quantified using inductively coupled plasma-optical emission spectrometry (ICP-OES) as per the method proposed by Zhou et al.30. Energy was determined using the following formula as described by Charrondiere et al.24: energy (kJ) = (total carbohydrate grams χ17 kJ) + (protein grams χ17 kJ) + (lipids grams χ 37 kJ). The results of this study were analysed according to the United Kingdom's nutrient-based standards (NBS), which are derived from the Dietary Reference Values, for an average school lunch.19 The NBS were used as they articulated well with the units and best described assumptions used in this study. It was deemed necessary to compare schools that served the same meal in order to explore the possible impact of the preparation methods on the nutritional quality. The results were expressed as grams/ day and milligrams/day for macro- and micronutrients, respectively, and as kilojoules/day for energy. All descriptive and inferential statistical analyses were performed using SigmaPlot 10.0.1, Systat software. In the cases of determination of significance, the t-test was used with a significance level of 0.05. Means of triplicate values ± standard deviations and percentages are used to present the results. According to the menus received from the schools and the one which had been designed by the DBE, balanced and wholesome meals should alternately include a green and yellow vegetable along with the starch and protein portions. However, the only measurable vegetables served during sampling were cabbage (served by schools A, B, C, E and F) and pumpkin (served by schools G and J) (data not shown). In addition, the cabbage was served as a replacement for or in combination with the protein portion of the meals. To further supplement the nutrient intake, it was expected that a fruit would be provided to each child per week; however, it was observed that only one school adhered to this regulation during the course of this study. The soluble sugars (glucose, fructose and sucrose) were quantified and the mono- and disaccharide contents are listed in Table 1. Low sugar contents were also reflected in the results of a study by Menezes et al.31, who found that the contents were below 0.5% of fresh weight for all foods and ranged between 3.07 mg/100 g and 38.42 mg/100 g for glucose, 3.77 mg/100 g and 55.90 mg/100 g for fructose and 9.39 mg/100 g and 368.27 mg/100 g for sucrose. These results were attributed to the high starch content of the foodstuffs. Carbohydrates (in the form of glucose) are the main source of energy in the human diet and consist of a diverse family of compounds, namely mono-, oligo- and polysaccharides.9 Further illustrated in Table 1 are the total carbohydrate contents of meals which ranged between 20.29±0.76 g/day and 59.41±0.10 g/day. These data were significantly (p<0.05) below the NBS minima of 70.6 g and 86.1 g for pupils aged 7-10 and 11-18 years, respectively (Figure 1). 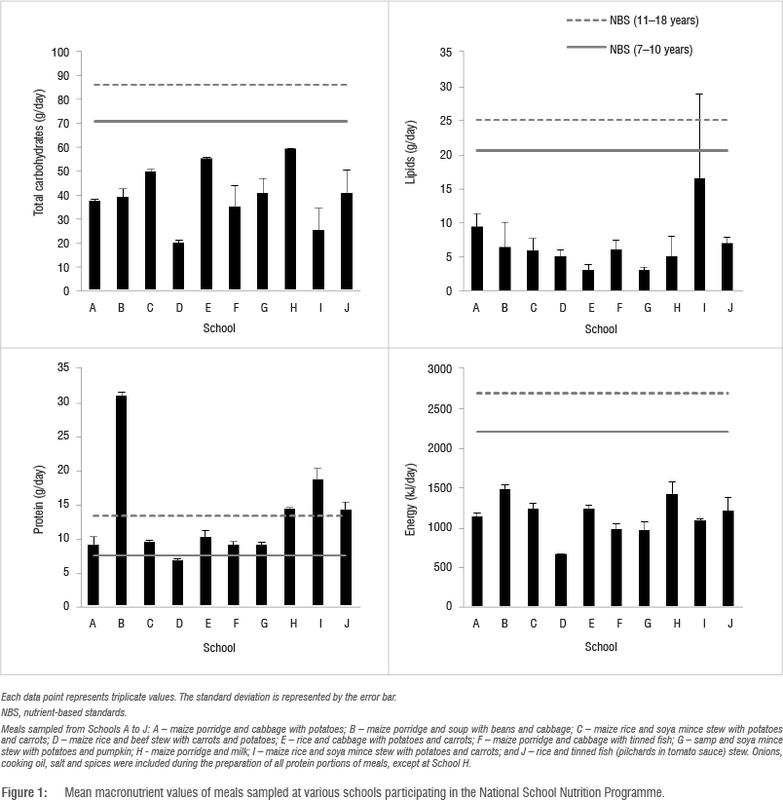 Similar results were observed from a study by Nicholas et al.32 in which school meals were below the standard (>86.1 g) required for carbohydrates at a content of 73.2±35.6 g. However, Pearce et al.33 found that school lunches yielded a carbohydrate content which was above the standard at 89.2±38.9 g.
Vitamin C contents of meals are indicated in Table 3 and meals from all the schools met the requirements for pupils of all ages as stipulated for an average school lunch (Figure 2). Similar results were observed in the studies by Nicholas et al.32 and Pearce et al.33. 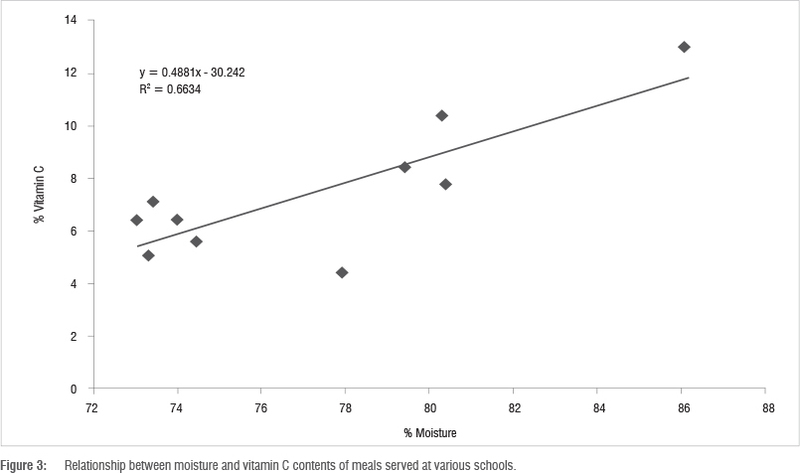 Both groups of researchers reported that the vitamin C contents of the school meals they analysed met the required standards. A study by Fontannaz et al.49 revealed that soya-based food contained higher vitamin C levels than meat-based food. This trend was also observed in the meals analysed in the current study as the food provided by Schools D and G, which included soya mince, contained higher vitamin C levels than the meals of School B (which included beef) and School H (which included milk). Vitamin C is essential for growth and repair of tissues in the body.50 In addition, ascorbic acid acts as a cellular antioxidant and facilitates intestinal absorption of iron and maintenance of plasma iron.51 Interestingly, meals collected from Schools D and I were prepared using similar ingredients, but the meal from School I contained higher counts of all quantified nutrients, except for vitamin C. The t-test indicated that the meal from School D had a significantly higher (p<0.05) vitamin C content than that of School I. This finding may be because vitamin C is water soluble and School D's meal had a higher moisture content (86%) than that of School I (78%). Furthermore, a moderate positive correlation between moisture and vitamin C was observed (Figure 3). 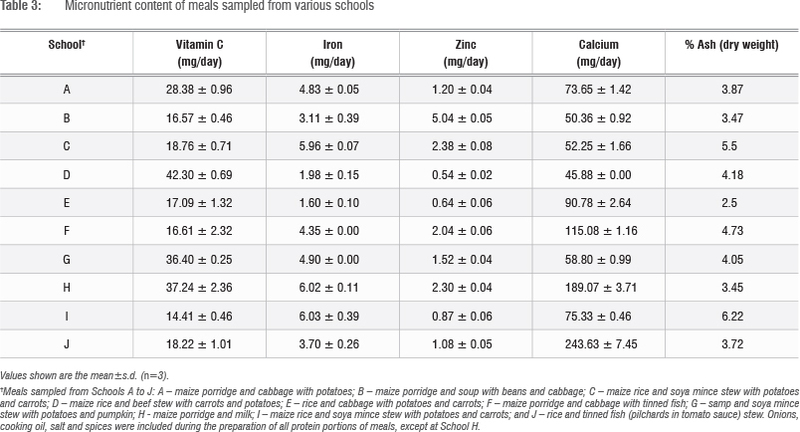 As illustrated in Figure 2, only two school meals did not comply with the nutrient standard (>3.0 mg) for iron content, for pupils aged 7-10 years, while seven schools did not comply with the standard (>5.2 mg) for those aged 11-18 years. 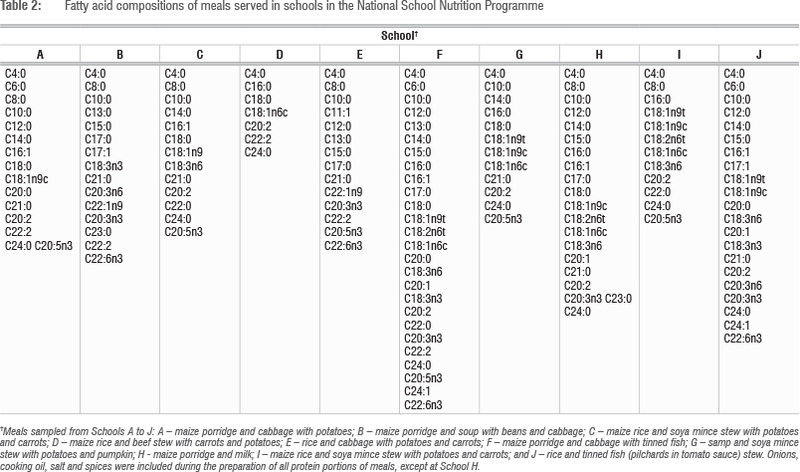 In addition, meals of Schools C, H and I had iron levels that were above the NBS for both age groups and the standard for the zinc content of school lunches was met by one meal (School B) for both age groups (Figure 2). Furthermore, for the 11-18 years age group, the calcium standard (>350 mg) was not met by any of the meals analysed while only one sample (School J) met the standard for individuals aged 7-10 years (>193 mg). Llorent-Martínez et al.52 observed significantly higher levels of minor nutritional elements (copper, iron and manganese) in soya products than in products of animal origin; however, the authors found that zinc levels were higher in foodstuffs of animal origin than of soya. A similar observation was made during the present study with the meal from School B containing the highest level of zinc (which may be attributed to the inclusion of beef) and lower levels of the other micronutrients. The results of the studies by Nicholas et al.32 and Pearce et al.33 indicated school meal values that were below standards for calcium, iron and zinc. A below standard calcium content and an above standard iron content were reported in the results of a study by Burgess and Bunker43. Iron is critical for the transportation and storage of oxygen in the body and children are at risk of developing iron deficiency anaemia should iron be deficient in their diet.42 Children require calcium for mineralisation and to maintain their growing bones. The primary sources of calcium are milk and dairy products,37 hence a calcium content above the NBS was expected from School H's meal (which consisted of milk). Zinc is essential for growth and healing of wounds in children, with the major sources of zinc being meat and seafood. The effect of storage conditions and preparation methods on the different nutritional categories was notable in this study. According to Yuan et al.53, food preparation methods induce significant changes in the chemical composition of foodstuffs. In addition, the literature suggests that high temperatures used in cooking have an effect on the contents of nutrient and health-promoting food constituents such as vitamins.54,55 Yuan et al.53 reported that various cooking treatments caused major losses of total soluble proteins, soluble sugars and vitamin C in broccoli as a result of the application of heat for prolonged periods. The authors also identified the use of excessive liquid as reducing the nutritional content of foods via leaching of water-soluble components into the liquid. Components of the meals sampled in the present study were prepared using high volumes of liquid with the possible aim of supplementing the foodstuffs. However, this practice may compromise the nutrient content of food as water-soluble nutrients (such as vitamin C and soluble proteins and sugars) may be lost through leaching into the surrounding liquid medium.56 Further deterioration and loss of nutrients (particularly vitamins) may occur from excessive exposure of foodstuffs to UV light and oxygen, the pH of the solvent or combinations of various conditions.56,57 Moreover, a study by Vinha et al.58 revealed that in all the studied parameters, temperature and storage duration caused statistically significant differences in the nutritional values of each food sample analysed. Macronutrients are relatively stable under various storage conditions; however, the length of storage considerably affects the retention of micronutrients with high losses observed as a result of prolonged periods of storage.56,57 It is therefore essential that NSNP-benefitting schools adhere to the first-in-first-out principle for storage. The small variety of ingredients in the meals served may be why the content of some nutrients are lower than the standards. In this regard, a study by Snelling and Yezek59 indicated that using nutrient standards to guide the selection of foods offered in schools may positively affect the intake of energy and nutrients. Therefore, to improve the macro- and micronutrient quantities of meals, NSNP-participating schools should serve meals that include a variety of whole grains, meat/meat alternatives, fruits, vegetables and dairy options.13 Food-handling methods, especially during storage and preparation, may also have a significant influence on the nutritional quality of foods. This influence was observed in the present study, in which there was a wide variation in nutrient levels in meals that contained similar components. Moreover, it may have been possible that vitamin C leached into surrounding media because meals with a high moisture content yielded higher values for this vitamin. It is further postulated that the undetected contents of vitamins A and E may be attributed to deterioration of these vitamins during handling of foodstuffs. Therefore, proper storage practices should be maintained to minimise loss of nutrients caused by exposing foodstuffs to surrounding elements and meals should be prepared in a manner that preserves the quality of nutrients. The Central University of Technology (Free State) and the National Research Foundation (South Africa) are hereby gratefully acknowledged for research funding. The Department of Basic Education (Free State) is acknowledged for support and cooperation in providing information about the schools and allowing us access to the school premises. This work formed part of N.N. 's master's degree. N.N. performed all of the experiments and wrote the manuscript. W.H.G. was the project supervisor and made conceptual contributions. R.J.F.L. made conceptual contributions and was responsible for the experimental and project design. E.K. assisted with the project design, made conceptual contributions and supervised the experimental analyses. 46. Kuyper L. Stability tests and sensory evaluation of fortified food vehicles for the national food fortification programme. Pretoria: Council for Scientific and Industrial Research; 2000. 18. Noe MH. The influence of aerosolized microorganisms on the safety and quality of fortified biscuits [MTech dissertation]. [ Links ] Bloemfontein: Central University of Technology; 2005.